Home Helpful Articles Interesting Articles Is the Military Shifting Gears towards Electric Vehicles? Is the Military Shifting Gears towards Electric Vehicles? The first thing that usually comes to mind when thinking about electric vehicles is a golf cart. After all, you can see them everywhere. It seems that new golf cart communities are popping up every year around the United States. It is interesting that the electric vehicle is good for much more than a round of golf or a short ride to the neighbor’s barbecue. In fact, the US military will spend 2.4 billion (yes, billion with a B) by 2020 to procure electric vehicles. Some of the vehicles they will purchase might look a lot like a golf cart, but others will look they came right out of “Mad Max” because they will be armored, have places to mount heavy weapons and operate capably off road in all types of terrain. They will perform all sorts of jobs for our military. Moving people, supplies and other essentials to troops that are right in the middle of all the action. Some of the more popular vehicles will be made by GEM, Polaris and Columbia. The US Air Force was the first branch to take an active interest in Electric Utility Vehicles, EUV’s. The center of their day-to-day is the flight line, which was made for a lighter, smaller EUV that can navigate easily around parked aircraft and the people working on them. The distances the vehicles have to travel is not very long, so a full day’s work can be completed on a single battery charge. With a platform at the rear these EUV’s can carry anything from ammo to lunch and can function well as either a hybrid or a plug-in vehicle. Following the Air Force lead, the other services are also investing in EUV’s to perform a variety of tasks. One of the major factors driving the interest is that each branch must meet certain “green initiative” goals, which are much easier to attain with vehicles that do not utilize fossil fuels. Many of the services are even graduating from cart-sized vehicles to full-sized electric trucks. Certain locations also favor the use of EUV’s. Hawaii, for example, is an archipelago of small islands, which creates shorter travel distances and less trips to the charging station. Even the US Navy has come on board, utilizing EUV’s at their land bases and aboard large vessels like air craft carriers. Most of the EUV’s originally purchased are non-tactical vehicles that perform service jobs efficiently and basically hauling people and equipment. The use of EUV’s in combat situations is growing in popularity, primarily because they do not produce a large radar signal and they do not produce any significant noise. These factors are especially important to forward-based troops that are observing enemy activity or doing reconnaissance to spot locations for future airstrips, facilities or ammunition storage. The stealth factor of an electric vehicle could not only make the mission easier to achieve but could also end up saving lives because enemy positions cannot hear troops coming. The biggest challenge for an EUV to be adapted for combat and tactical use is the amount of power it can generate. Most of the military rely on powerful electronics to handle communications, threat identification, jammers and on-board computers. Scientists are working as fast as possible to resolve these issues so that command and control electric vehicles can play an even larger role in our national defense. So as our military strives to go green without giving up any tactical advantage, we are sure to see continued evolution of the EUV. And, that means our personal golf carts will just keep getting better and better. I mean who among us has not wanted a rocket launcher at some point to take out a tree that stands in the way of our making a birdie? Seriously, though, if you’ve had an electric golf cart for a couple of decades you can consider yourself a pioneer in the development of our democracy’s newest defense. 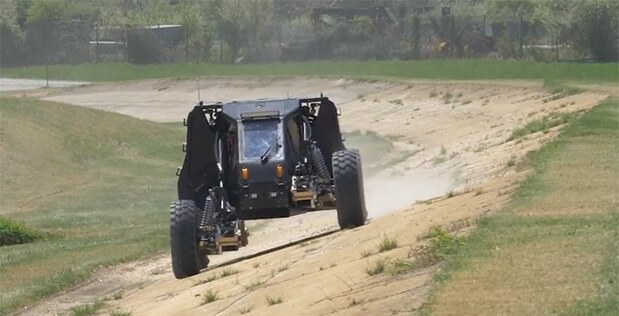 As an example, check out the video below of DARPA’s Electric In-hub Motor technology that they are implementing into the wheels themselves. Check it out at 1:55.